Voters and candidates asked the Election Commission (EC) to take responsibility for poor preparations that led to mistakes, confusion and inconvenience to advance voters abroad last week even as the country braces for millions of early votes expected to be cast in the Kingdom this Sunday. THE NORTH was once again choking under dangerous levels of PM2.5 dust particles yesterday. 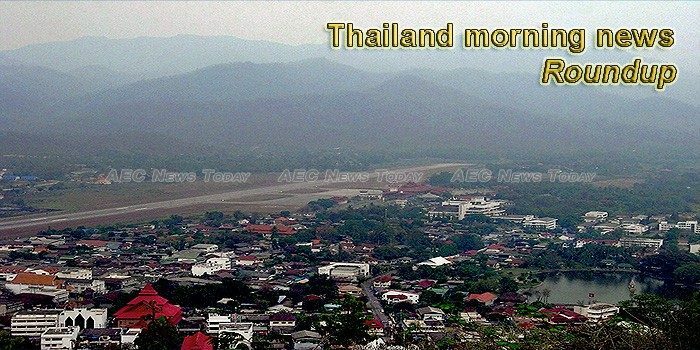 For instance, tambon Wiang Phang Kham in Chiang Rai’s Mae Sai district cited the day’s peak at 128 micrograms (mcg) per cubic metre of air, more than double the Thai safety limit of 50mcg. On 8 March, Col Burin Thongprapai, the NCPO’s legal officer, filed a complaint with the Technology Crime Suppression Division (TCSD) against the website administrator and other relevant personnel of the Future Forward Party (FFP) for contempt of court. BANGKOK — Deputy junta chairman Prawit Wongsuwan said Monday a suspect has been taken into custody in connection with yesterday’s bombing spree in the southern region. BANGKOK — Election officials are on the defensive after overseas voters complained angrily about a raft of problems including missing ballots, incorrect candidate information and poor voting facilities. BANGKOK — Those living in the most-polluted corners of the realm may live four years less than they may have elsewhere, according to a recent study. The wealthy operator of a business selling weight-loss products was arrested on Monday morning as part of an extensive police operation and charged with possession of controlled substances. Savethanathorn, a suspicious fanpage, has withdrawn a support from Thanathorn Juangroongruangkit for bringing Future Forward Party (FFP) back into cycle of conflicts. PHOTO: Thai PBS A long queue of waiting voters spilled out of the Thai embassy compound in Kuala Lumpur during yesterday’s early voting. Over 4,000 Thai nationals working in Malaysia turned up at the Thai embassy in KL yesterday to cast their ballots. Many northern provinces on Monday were suffering from dangerous levels of PM2.5 dust particles, including Tambon Wiang Phang Kham in Chiang Rai’s Mae Sai district with the day’s peak of 117 micrograms per cubic metre (mcg) of air, more than double the Thai safety limit of 50mcg. Over the past few days, Abhisit Vejjajiva was provoked by two key figures on both sides of the national divide. Phuket security officials have increased safety and tourist security after suspects set off pipe bombs in Statun and Patthalung during the weekend. Bangkok -Somwalee Limrachtamorn, the managing director of Nielsen (Thailand), the leading provider of marketing information and consumer-related measurement, has disclosed that the state welfare card scheme, which offers each card holder 200-300 baht a month to buy consumer products and spend on. Fine arts department succeeds in halting oil- drilling project to conserve ancient temple complex. People around Thailand are being invited to set worshipping tables and decorate their homes with a new royal emblem that has been created specially for the coronation in May. Among the convicted criminals having to wear electronic monitoring (EM) devices on their wrist, ankle or elsewhere so the authorities can keep track of them are hunters caught poaching the nearly extinct giant Asian river frog. NONTHABURI — Representatives from four major parties presented dueling policies Monday to benefit the elderly who make up about one-fifth of the electorate. When he’s not pulling the levers of power, junta chairman Prayuth Chan-ocha is a simple human who eats modest meals. Bangkok – Province across the kingdom are gearing up preparations for this year’s drought season, dredging canals, installing pumping machines, and limiting water for crop farming. In Phichit province, local officials dredged the Bueng Si Fai swamp to increase its storage capacity. THE THAI Traditional and Alternative Medicine Department (TTAMD) is planning to try 16 cannabis-based medicines on selected subjects in a research project starting in July. DRIVEN by big potential in Myanmar’s food wholesale industry, Metro AG, a leading German wholesale company with operations in 36 countries, will expand its business in the nation, say the firm’s senior executives. A rescue worker with the Ruamkatanyu Foundation was upset this week to find a handwritten note on the windshield of his ambulance asking him to park elsewhere because the homeowners there were frightened by its presence. BANGKOK — Police said an investigation is underway to find those responsible for a bombing spree that struck the southern region Sunday but declined to identify any suspects. THE FOOD and Drug Administration(FDA) this week will table two public health ministerial announcements and a ministerial legislation concerning advertisements on the use of marijuana before the public health minister and the Cabinet, seeking endorsement. The Electricity Generating Authority of Thailand (Egat) has estimated that power consumption during late April and early May would peak at 29,000 megawatts (MW), which is two per cent more than the same period last year. A fully-equipped medical boat on standby for traveller emergencies in the Similan and Surin islands has already saved seven lives during the current tourist season. SEVEN foreign criminals have been arrested over the past week in a Thai police crackdown on travel document forgery, fraud and drugs smuggling, Immigration Bureau chief Pol Lt-General Surachet Hakpal said on Monday. SHAH ALAM, Malaysia — An Indonesian woman held two years on suspicion of killing the North Korean leader’s half brother was freed from custody Monday after prosecutors unexpectedly dropped the murder charge against her. THAILAND’S AMBASSADOR to Nepal has inaugurated several buildings funded by Thailand in Nepal’s Melamchi and Helambu villages, in the area hit the hardest by the 2015 earthquakes.